I am doing really well sticking to Freshology, but haven’t been as great with exercising. Until now. I, the queen of sleeping as late as possible (even if it means only 10 minutes to get ready including a shower), have committed to walking at 6:30 twice a week. A friend from work and I are going to meet at the park and walk a mile and a half. We started today, and it went really well! I admit I was a little thrown off that it was still pitch black when I left the house, but once we started walking it went by quickly, and it was SO nice having my exercise over with before my day really even began. 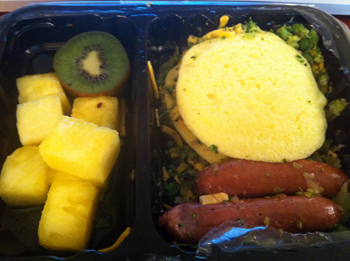 This is probably my favorite omelet I’ve had so far – the broccoli and cheese was a really nice flavor combination! I also like this sausage the best – the maple sausage and the apple chicken sausage are a little too sweet for me. Great Asian option! I avoided the cabbage/salad mixture you see on the right, but everything on the left was SO good. The teriyaki sauce they included tasted just like something I’d get from a restaurant. The broccoli and beef were both tender. 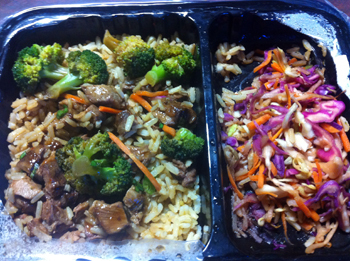 The rice initially seemed a little dry to me, but once I mixed in the teriyaki sauce it was perfect. I didn’t really get the “herb-crusted” feel from the turkey, although a herbed flavor did come through nicely. My favorite part of the whole meal was the potatoes. SO good! 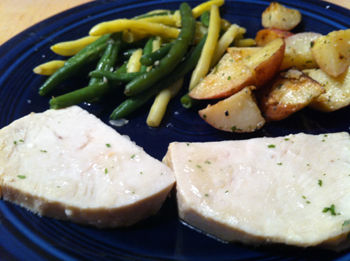 The green beans were great too – I enjoyed this whole meal. 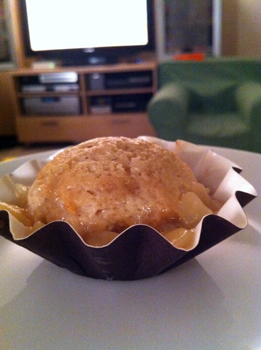 I heated this up before eating it – it was a down home, comfort-food kind of dessert. The tartness of the apples and cranberries was really good! Please excuse me now while I go crash! ‘Night everyone! Get FREE tickets to the Lion King 3D Advance Screening in Dallas!